Wildflowers are adding color to the landscape in California State Parks. Visit California State Parks on-line. Now is a great time to discover what state parks have to offer. It’s always a good idea to call before your visit, because conditions can change due to weather. Calaveras Big Trees State Park, four miles north east of Arnold on Highway 4, is known for its wildflowers in June, especially along the Lava Bluffs Trail. The park phone number is (209) 795-2334. Mount Diablo State Park is located in the heart of the Bay Area and is known for its "bloom with a view". With the winter rains, increasing day light, and the warmth of spring triggers a bloom for many of Mount Diablo's native wildflowers. There are a number of beautiful flowers to view, especially in the chaparral and near grassy hilltops. Come take in the bloom of brightly colored wildflowers and enjoy the view that only Mount Diablo can offer. For more information, call the park at (925) 837-2525. Del Norte Coast Redwoods State Park, seven miles south of Crescent City on U.S. Highway 101, has magnificent displays of rhododendrons that can be seen from the highway as well as numerous roadside turnouts in April and May, depending on the warmth of the spring. For more information call the Redwood National and State Park information center at (707) 464-6101, extension 5064. Millerton Lake State Recreation Area, 20 miles northeast of Fresno, features spring flowers on the Blue Oak Trail, an easy walk. Visitors taking a more strenuous hike on the Buzzards Roost Trail can also find spring flowers. The park phone number is (559) 822-2332. Azalea State Reserve, five miles north of Arcata, preserves outstanding examples of azaleas that generally bloom in April and May. The reserve has a parking lot and trails. For more information call the sector office at (707) 488-2041. Humboldt Redwoods State Park, 20 miles north of Garberville, provides excellent displays of wildflowers along the Avenue of the Giants. Visitors will find Humboldt Lilies and orchids in late March to April and Dogwood in April into early May, depending on the warmth of the spring. For more information call the park visitor center at (707) 946-2263. Prairie Creek Redwoods State Park is 50 miles north of Eureka and 25 miles south of Crescent City on Newton B. Drury Scenic Parkway off of Highway 101. Careful observers in the park will find beautiful but elusive orchids among the ancient redwood groves as well as more prominent displays of rhododendrons along the parkway in late March through May. For more information call the park visitor center at (707) 464-6101 extension 5300. Antelope Valley California Poppy Reserve, 15 miles west of Lancaster on Avenue I, generally features its greatest blooming period in March and April, depending on rain for the State’s flower. For more information, call the park at (661) 942-0662. Information and photos about the park can be found online at www.parks.ca.gov For recorded information about the poppy reserve and the blooms, call (661) 724-1180. Mount Tamalpais State Park, North of San Francisco's Golden Gate, features spectacular and easily-accessed wildflowers each spring. Visitors can get to the park from Highway 101 take Highway 1 to the Stinson Beach exit and follow signs up the mountain. The park phone number is (415) 388-2070. Olompali State Historic Park, three miles north of Novato on U.S. 101, also features spectacular and easily-accessed wildflowers each spring. The par entrance is accessible only to southbound traffic from Highway 101. The park phone number is (415) 892-3383. The Ford House, the visitor center at Mendocino Headlands State Park, will have a fresh wildflower show featuring local specimens during the month of April. The park surrounds the town of Mendocino. The park phone number is (707) 937-5397. Reny Parker, author/photographer of “Wildflowers of Northern California’s Wine Country and North Coast Ranges,” will have a wildflower photo show at the center during April and May. Pacheco State Park is a good place to visit in April for wildflowers. The park is on Highway 152, located 20 miles east of Gilroy. The park phone number is (209) 826-1196. San Luis Reservoir State Recreation Area, 12 miles west of Los Banos on Highway 152, features spring wildflowers throughout the park. The park phone number is (209) 826-1196. For late season wildflowers, Bodie State Historic Park, 13 miles east of Highway 395 on Bodie Road, is blooming when the rest of California is wilting. The park’s 8,500 feet elevation insures that July is colorful. The sage brush landscape provides unique mixing of plants from both the Great Basin and High Sierra. Call the park at (760) 647-6445 for more information. Andrew Molera State Park, 21 miles south of Carmel on Highway 1, features several different trails that display a variety of springtime flowers. The most popular is the Headlands Trail, which winds through a riparian forest, an open meadow, and onto a coastal bluff overlooking the Big Sur River mouth. Nearly every color of the rainbow is represented in the park's wildflowers, including lizardtail, common yarrow, California lilac, yellow bush lupine, seaside painted cup, sticky monkey flower, sea lettuce, California poppies, seaside daisies, seacliff buckwheat, black sage, and Douglas iris. This is a relatively flat, easy two mile round trip hike with two sets of stairs. For more information, call the park at (831) 667-2315. Carmel River State Beach can be reached from Highway 1 in Carmel via Ocean Avenue and Scenic Road. Wildflowers can be found along the bluff trail. For more information call Point Lobos State Reserve at (831) 624-4909. Garrapata State Park, 6.7 miles south of Rio Road in Carmel, features the Soberanes canyon/ridge trail that winds through meadows, a riparian zone, a lovely redwood grove and an exposed coastal ridge. On certain sections of this trail visitors may feel that they’re swimming through flowers, which can include Shooting Stars, Johnny Jump Ups, Blue Dicks, Golden Buttercup, Elegant Clarkia, Goldfields, Douglas Iris, Checkerbloom, Star Zygadine, Fushia-flowered Gooseberry, Trillium, Tidy Tips, Footsteps of Spring and a fantastic variety of Bush Lupine. 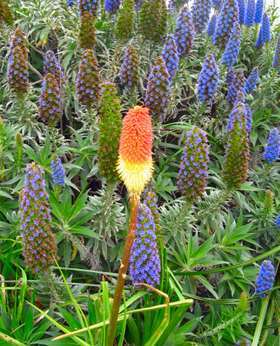 Visitors can also encounter the more common Monkey Flower, Seaside Painted Cups, Coyote Brush, Lizard Tail Yarrow, Mock Heather and Poppies. Visitors are advised that this is not a particularly easy hike. The first couple of miles are relatively flat and easy but the ridge can only be reached by a steep climb. For more information call Point Lobos State Reserve at (831) 624-4909. Point Lobos State Reserve, three miles south of Carmel on Highway 1, features a fairly easy hike with coastal bluff flowers. The park phone number is (831) 624-4909. Salinas River State Beach, 16 miles north of Monterey and one mile south of Moss Landing, has a nice section of wildflowers along the boardwalk at Molera Road. The contact phone number is (831) 649-2976. Zmudowski State Beach, one mile north of Moss Landing, features wildflowers in late spring, although many of them on non-natives. The contact phone number is (831) 649-2976. Guided wildflower walks will be offered at South Yuba River State Park this spring. The guided walks will be on Saturdays and Sundays at 11 a.m. starting March 8 through May 18. The walks will be docent led. The meeting place will be at the South Yuba River State Park at Bridgeport in Penn Valley (Nevada County) Also, special group led wildflower walks will be offered by reservation. The walk is along a Historic Water Ditch with scenic views overlooking the South Yuba River. For more information, contact Ranger Mike Smittle at (530) 432-2546. Montaña de Oro State Park, seven miles south of Los Osos on Pecho Valley Road, can feature hills covered with poppies, lupines, sticky monkey flowers, wild radish and mustard. Best time to visit is April and May. For more information call (805) 528-0513 Thursday through Sunday, 11 a.m. - 3 p.m.
Henry W. Coe State Park, in the mountains south and east of San Jose, is a wonderful place to see spring wildflowers. Early in the year visitors may see white milkmaids, blue hounds tongue, or yellow buttercups. As spring progresses, the flowers become more numerous with goldfields, owls clover, butter and eggs, columbine, delphinium, and may more. Visitors might even get lucky and see the tiny purple mouse ears. Short wildflower walks - less than two miles and less than two hours - are given every Sunday at 11 a.m. and 2 p.m. from the middle of March through the Memorial Day Weekend. For more information see the park website at www.coepark.org The park phone number is (408) 779-2728. Castle Crags State Park, six miles south of Dunsmuir on I-5, has a variety of wildflowers in the spring. The park phone number is (530) 235-2684. Kruse Rhododendron State Natural Reserve, directly adjacent to Salt Point State Park north of Jenner, features a beautiful second-growth redwood forest mixed with Douglas Fir, Grand firs, Tanoaks and many Rhododendrons. Each May the green of the forest is punctuated by patches of pink as the rhododendrons bust into bloom. The wealth of rhododendrons is a direct result of normal plant succession patterns following a severe fire that once occurred here. Today, the regenerating forest is gradually overwhelming the rhododendrons. For more information, call the park at (707) 847-3221. Woodson Bridge State Recreation Area, six miles east of Corning and I-5 on South Avenue, has a variety of spring wildflowers. The park phone number is (530) 839-2112. Railtown 1897 State Historic Park, in Jamestown, features Wildflower Trains on Saturdays April 19 and May 3. The special afternoon train departs from the Railtown 1897 Depot at 4:30 p.m. these two Saturdays only. Prior to boarding the train, passengers will have the opportunity to familiarize themselves with wildflowers of the Sierra Nevada foothills. The train features Interpretive Park Rangers from the New Melones Recreation Resource Center, who answer questions and point out flower groupings along the scenic journey through the Gold Country. En route, a stop will be made to allow guests to spread wildflower seeds along the tracks! Tickets are $10 adults, $4 youths age six to17, ages five and under ride free. Train capacity is limited, and reservations are suggested. Call (209) 984-3953. Regular steam-powered excursion trains also depart on-the-hour from 11 a.m. to 3 p.m. this day.